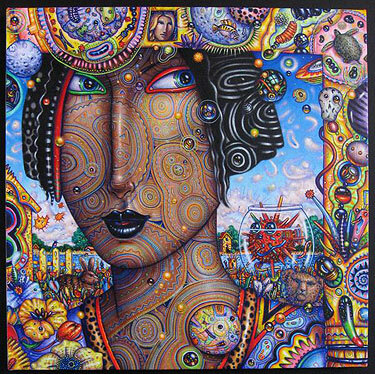 The colorful original fine art paintings of John A. Kurtz are so full of detail that you can never seem to notice everything in one go. A master of color and technique, Kurtz's paintings draw the viewer in through sheer intricacy and well-balanced compositional chaos. 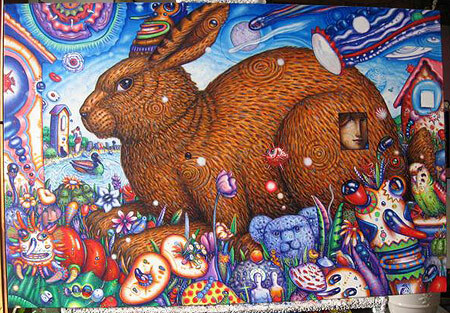 This page will take you on a journey through several of John's colorful and creative paintings and drawings. Come along and see how he creates his colorful art pieces from start to finish, and also get an inside peek into his studio! One of John's prominent motifs is a series of detailed ladies who seem to emerge from another place and time, peering enigmatically at the viewer from the canvas in a subtle Mona Lisa smile. These women are elegant and elusive, their faces painted with mysterious designs. Who are they and where do they come from? 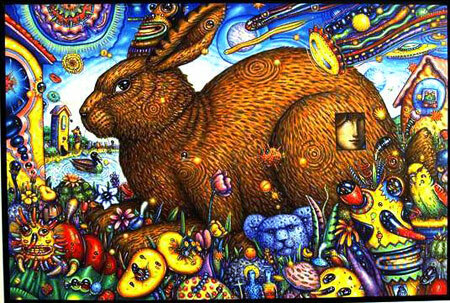 We can look for hours and still not know, but at least the imagining takes us on a whirlwind mental journey through the mind of the artist. 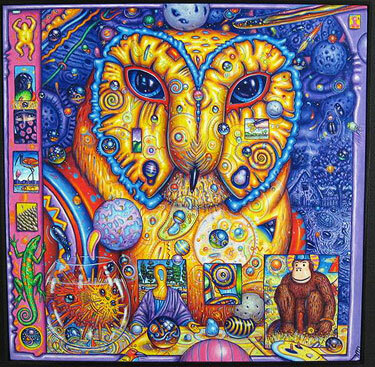 John A. Kurtz draws upon nature for the basis of his imagery, which is then wildly altered, exaggerated, and imbued with shocking color. 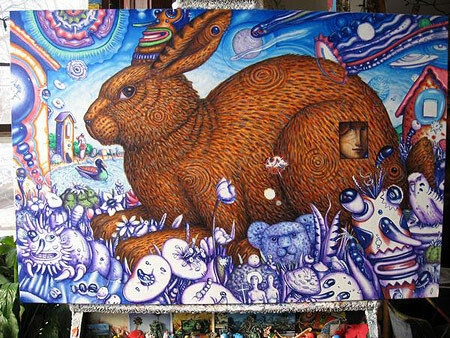 Elephants, fish, owls, ducks, monkeys and bunnies co-exist in crowded compositions with creatures from beyond – spiky insects, and flying jellyfish (along with numerous creatures that defy description) round out his psychedelic designs. 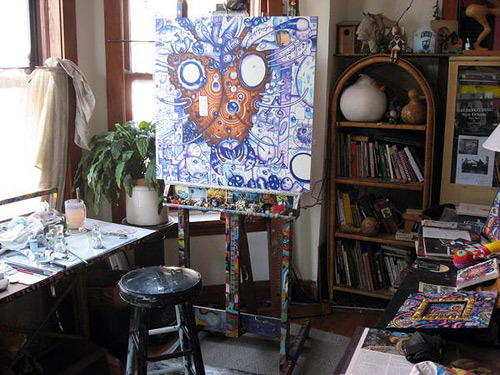 Let's take a look inside John's sketchbook, where most of his ideas for paintings are born. 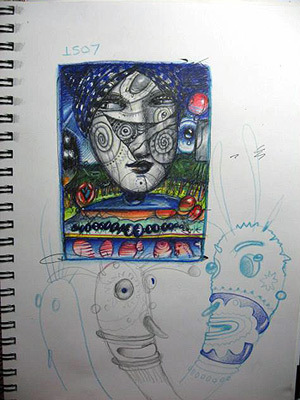 Working in pencil and pen, John quickly captures the essence of his ideas in his sketchbook. 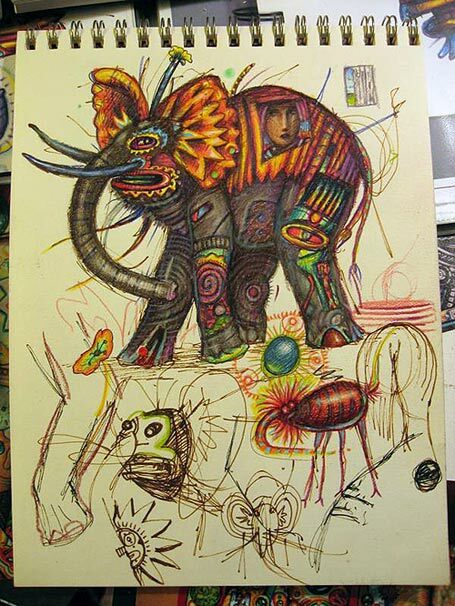 Using colored pencils, he adds color to his sketches. By working out the color details in his sketchbook, John figures out what colors go where before he even picks up a paintbrush. 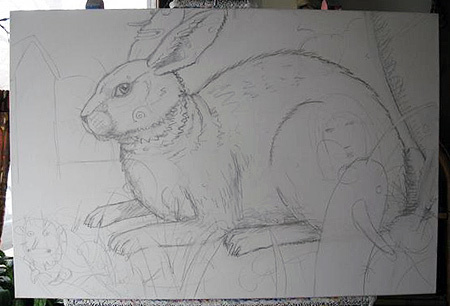 This makes it easier when he stands at the easel, ready to paint. John begins by sketching his image onto the canvas with charcoal. 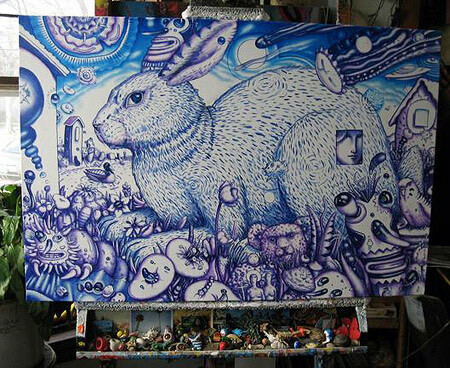 After the composition has been laid out in charcoal, he begins his painting by outlining the forms in blues and purples, and introduces subtle shading. He begins to add other colors, such as reds, browns, and touches of green. More colors are added as more details begin to emerge. The finished colorful original fine art painting. He adds the yellows last, working in a dark-to-light manner throughout the painting process. What is your favorite brand of colored pencil? I have been using Prismacolor. 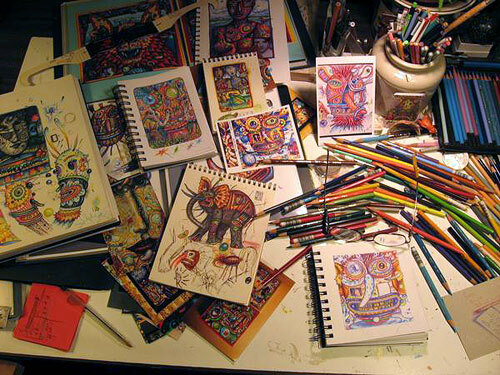 Do you sell your colored pencil art as "finished" artworks, or do you mainly use them for sketching out ideas? Both - I do finished colored pencil drawings that will be framed and sold and I'll color inked sketches to be used in reference for future paintings. What's your favorite brand of acrylics? Liquitex and Golden when I can afford them. Do you prefer to paint on wood or canvas (or another surface)? I prefer to paint on canvas or masonite (for works under 20" x 24")… but I have also painted on kites, bird houses, gourds, hats, bodies (human), chairs, metal, telephones and televisions. Before you begin a painting, do you sketch your ideas on paper first? 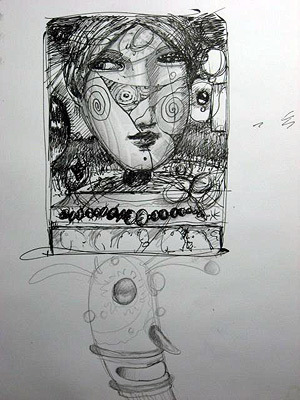 I will sketch out an idea with vine charcoal on the canvas from sketchbook drawings. 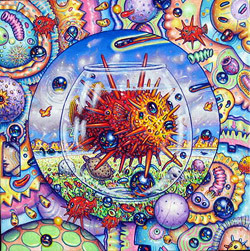 Are there any artists who have influenced your art/style? I am influenced more by nature and music than by other artists. A favorite is Tchaikovsky's violin concerto. I never leave the house without a pocket sketchbook and my digital camera. Is your work space neat, cluttered, or neatly cluttered? Work space neatly cluttered. The only thing I have trouble finding is my glasses. Many thanks to John A. Kurtz for answering these questions and sharing these photos with us! 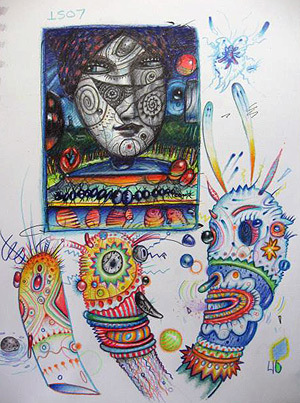 You can connect with John, see more of his colorful original fine art paintings and drawings, and purchase prints via his Facebook page.